Disclosure: I was sent a DVD from the vendor in order to write up an honest review. The views shared are mine and mine alone. Pre-order on DVD from Amazon for only $14.29. Synopsis: "Your favorite little princess-in-training returns for more music, majesty and magical fun, so get ready to have a ball with Sofia the First! Becoming royalty overnight is every girl’s dream, and Sofia is eager to prove she can be a true princess. Visit an enchanted circus, meet a pet dragon and soar through desert skies with Sofia and Amber on a magic carpet ride! But when their high-flying adventure veers off course, it’s special guest Princess Jasmine to the rescue with inspiring advice about trying new things, staying strong and trusting yourself. Sparkling with extraordinary song unforgettable characters and thrilling surprises, Ready to Be A Princess opens the door to a whole new world of kindness, helping others and being the best you can be! Series: story of Princess Sofia, an adventurous little girl who is learning how to adjust to royal life after her mom marries the king and she becomes a princess overnight. Sofia quickly discovers that looking like a princess isn't all that difficult, but possessing the characteristics of a true princess – honesty, loyalty, courage, independence, compassion and grace – is what makes one truly royal. For more details on the show, please visit www.disney.go.com/disneyjunior/sofia-the-first "
Because of the chilly fall weather we had this past weekend, the girls opted to stay indoors as they got over yet another head cold. Their time spent inside was filled with tuning into the Disney Channel to watch the "I am a Princess" weekend special, I spoke of on Friday, as well as helping me watch and review upcoming DVD releases, including "Sofia the First: Ready To Be a Princess." 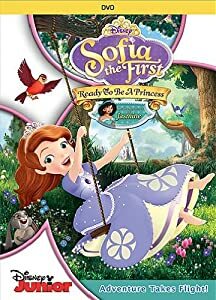 If you little girls, then you have probably seen the hit animated series that was added to Disney Junior's lineup last year, "Sofia the First." My girls and I have been watching this fun show about a common girl who become a princess when her mother marries the prince. But, her transition into the princess role is not easy. She is met by a step-sister, who is jealous and also doesn't want to share the princess title. As for Sofia, she loves everything involved in being a princess -- the pretty dresses, parties, etc. In addition to these episodes to watch, you will also receive a fun dress-up play set with wardrobe, which is included inside the DVD case. While Arabella was to young to play with this play set, Savannah had a blast sitting at the kitchen table yesterday dressing the Sofia cut out up in different outfits. 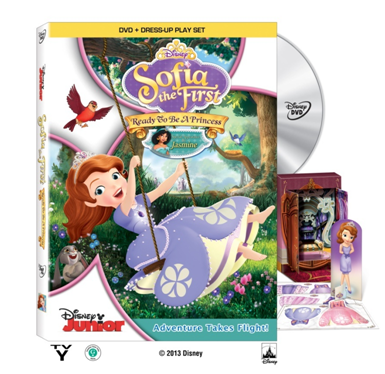 I was surprised to see this play set included with the DVD, as it could have been sold separately and been a hit with Sofia the First fans. But, instead, this play set will just add to the fun your little princess with have, when you share this new DVD release with her. So, make sure you either pre-order this DVD now, or pick up when it becomes available in stores on September 17th.